Social media is one of the sources, from which blogs get traffic. Social channels like Facebook, Twitter, YouTube and LinkedIn are extensively used by bloggers to create a strong social foothold. Pinterest is among the channels whose true potential hasn’t been tapped for blog marketing. In this article, we’ll learn how a blogger can use Pinterest to drive traffic to his blog. Pinterest’s built-in analytics can provide you with all sorts of information such as the number of clicks and impressions, audience demographic details, and the number of repins, likes and viewers. Third party apps can offer you more specific and more analytics-worthy information such as the virality score, rate of followers change, engagement score, image analytics, etc. Virality and engagement scores are KPI’s as they help you understand how your Pins are performing. Using such metrics, you not only track your activities on Pinterest but also identify the bottlenecks and the areas to improve your campaign performance. As your pins start to attract more followers, your campaign shows better performance in terms of conversion and your blog gets more traffic. The use of analytic tools helps you understand your audiences better. How does it help? You’ll find what content will satisfy them. Blogging on children’s products can bring you traffic from Pinterest. Blogging on women’s fashion accessories and home appliances can drive traffic from Pinterest to your blog. Pinterest users are unlikely to skim through your pins as the retention rate is high. They’ll view your pins with attention. When your blog reflects insights acquired from Pinterest, the quality of individual posts are enhanced, and the posts are optimized for Pinterest users. 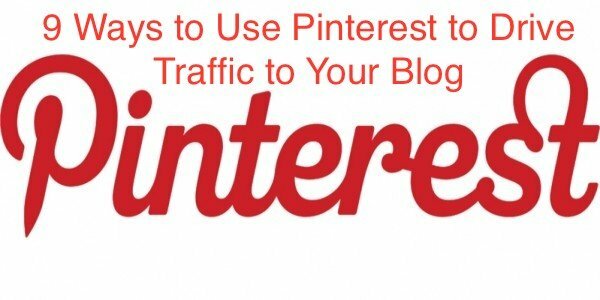 This way, your blog gets more traffic from Pinterest. Interaction is so easy on Pinterest that other networks have a reason to envy it. The recipe of a successful interaction is a smooth delivery of information across the board. On Pinterest, you don’t have to send a private message. All you need to do is create new boards, add new pins, invite others and like and re-pin other’s pins. Pinterest is one of those very few channels where users are proactive, and they are hungry for new pins. To cater quality content to them, don’t restrict your pinboard to images from your own blog. Feel free to pin images from other websites with or without the Pin It Button. Share pins that get a good number of visits and shares on their content. Use Pinterest browser add-on so you can seamlessly pin content from other sites. Non-stop strategic interaction can help you create a network in and outside of Pinterest. On Pinterest, the network will be created with other users and outside of Pinterest, with the site owners, whose images you’ll be pinning on your board. Blogging is all about building networks, and your blog will benefit from it. Content marketing best practices for 2016 include content curation. Alex Ayling, the head of BBC Worldwide Digital Studios explained why brands will become content curators and dish out curation-worthy content to users this year. Pinterest is the mecca of curation. Adding Rich Pins to your board facilitates curation. Rich Pins can increase the repin ratio by more than 80%. A Rich Pin is any pin that has useful information on it, which audiences can access from the pin itself. An example of Rich Pin is an infographic, a product page with the RRP (retail price) on it, etc. As you repin other’s pins, they feel obliged to curate your pins, increasing your Pinboard visibility. Content curation on Pinterest doesn’t send traffic to your blog upfront. It hooks users on your board, lending you a hand in traffic conversion. A successful blogger is one who cares for his readers. Being a blogger, you have to show this care when marketing your blog on Pinterest. The best way to show care for Pinterest users is treating them with stunning visuals. Pinterest is a visual journey. Uploading high-quality images as pins enlivens the journey for users. In case you are not using photographs, make sure the fonts and typefaces of the visuals exhibit uniqueness and the use of colors is consistent. If you’re using images, make sure they are tall. According to Dan Zarella, a social media expert, the taller the image, the more repins it gets. The image length is not the only factor that decides its quality. Another factor is whether the image is stock or original. A rule of thumb for all Pinterest marketers should be to post original images. Original images boost branding. Volkswagen used an actual photograph of the Karmann Ghia model on Facebook. The result was 574 people liking the post and 43 people sharing it. This is an example of what original images can accomplish for a brand. If Facebook can account for such engagement, imagine what Pinterest as a visual network can perform. Bloggers, who review products should hire a product photographer and post product images produced by him on Pinterest. Photographs display a professional touch and are sure to generate a number of repins and likes. Keywords make it easier for others to find your blog post pins. You should be careful when using keywords. For better visibility, make sure the title of the board is the title of your blog. Using long-tail keywords, relevant to individual blog posts and applying appropriate techniques to optimize them are vital. Interestingly, you can use Pinterest to obtain keyword related insights. Clay Cazier explains how Pinterest assists in recognizing the semantic relationship between products and the phrases, used to describe them. Insights obtained this way can be used to better promote your blog, so that it gets decent traffic. B2C blogs fare better on Pinterest because retail buyers are all into the visual experience. However, B2B blogs can also be promoted on Pinterest depending on the niche of the blog. Workstations, lead-acid batteries, laser toner cartridges are B2B products. B2B business blogs can upload actual photographs of those products from their inventories on Pinterest. A professional chimney sweep can take a picture of a clean, and soot and creosote-free chimney and upload it on Pinterest, so a commercial building manager hires him for his service. B2B customers prefer personalized content as much as B2C customers do, and what could be a better personalization tool than images? The pin above shows the power of personalization. The uploader, an enterprise, aimed to introduce its employees to prospective customers in a fascinating way. You can attract followers to your niche by visually rendering niche-specific content wrapped with personalization. Your audiences will be interested to learn about your brand and products. This way, they’ll end up visiting your blog. It should be clarified at the beginning that group boards don’t send direct traffic to blogs. Bloggers use them to build a thought-leadership position, from which they ultimately receive blog traffic. The process may appear tiresome and complicated, but it helps you create an effective network, collaborate with others and build authority. However, use your group pinboard with caution if you want to appear as a brand and drive pinners to your blog. You can create a group board yourself or add pins to someone else’s pinboard. Pins on a group board should be more than 0.2 cents in value. They should supplement information provided already, have hard data to back up your claims or opinion, and should be engaging. If you are creating a pinboard yourself, a viable strategy would be inviting others to pin on your board. Why would they accept your invitation? You might wonder. They’ll respond if they find the topic interesting. The topic of the group board should either be the same as your blog’s theme or connected to it. If you’re joining a pinboard, make sure it’s user-frequented and relevant to the niche of your blog. For example, join a pinboard on auto recycling if you write on automobiles or a beauty board if you blog on fashion. Mobile devices, unlike desktop devices, have a small screen. Users rarely click on hyperlinks because they often can’t distinguish the hyperlinked areas from rest of the content. Last year Pinterest introduced Buyable Pins for in-app purchases to cut down the number of affiliate links. Rand Fishkin in his Whiteboard Friday explained why traffic through referrals is rare on the mobile web. Since Pinterest offers a visual experience, you may see engagement on your pinboard, but you may not see traffic landing on your blog. Having a responsive website, so all devices render it the same way. Using Adaptive Web Design (AWD) for an impressive UI design. Having a 50-50 ratio between text and images. If Pinterest users find your site easy-to-browse and loaded with useful information, then they’ll refer it to other pinners. This way, your blog can get more traffic. Ignoring Pinterest is a grave mistake. Pinterest marketing has proven itself highly effective for a better ROI. Using Pinterest to get blog traffic is an offbeat approach, but the 9 ways discussed here can pull it off.